Son: Mom, do you mind if I bring some friends home for the holidays? Me: Of course not honey, your friends are always welcomed into our home. Will they be sleeping over? Do they need towels? Me: Well, I am sure they will be respectful and understand that we need to go to work and school. *I am consequently now hosting, two of his “college roommates” who are partying it up like party animals do, chewing things up and getting ON my dining room table! There is one word in Spanish that sums up perfectly when something is disgusting and that word is, FOOOOOOOOOOO! Daughter: I got accepted to Fordham University! Me: Oh my gosh, that is wonderful. You must be so proud of your hard work. I immediately called Fordham to confirm that she is NOT one of the 2500. They informed me that they could not give me that information (aren’t’ I the one paying?) but that if her notification was sent via the Fordham portal and not a separate email, then the acceptance is legit. Do you know what it is like to think about having to tell your Type-A 17-year-old daughter that the acceptance was a mistake? Let’s just say that I had a major hot flash at that very moment. Thankfully, the GODS heard my cries and all the planets and stars aligned perfectly and she is indeed, accepted. *She got a couple of other acceptances from her early applications and now we wait for the next round of applications to be sent. JOY! Me: So Doctor, if the endoscopy showed that there is no obstruction, no GERD, no cancer and no other issues AND the MRI showed that I do not have bone spurs poking my esophagus then, WHAT THE HECK IS WRONG WITH ME? Doctor: Well, it could be a motility issue where your esophagus goes into muscle spasms when you swallow food. Me: But I already have all kinds of weird ailments and vagus nerve issues that affect my “movements” and even my hair hurts sometimes! Why do I have this strange motility issue? Doctor: Let me consult with my colleague at Mass General in Boston to check if there is a correlation between dysphagia (problems swallowing) and Rheumatoid Arthritis. Me: In the meantime, how do I do what I do best? Eat? Doctor: I will call you on Monday. One thing we could do is to perform another endoscopy but this time inject Botox into your esophagus while we are in. Botox can relax your muscles in your esophagus and its effects will last several months. Me: Oh, goody! This idea thrills me immensely! What happens after a couple of months when the much wasted on my esophagus Botox wears off? Doctor: If the muscle spasms do not stop, we give you some more Botox. Oh, I can just FEEL that rush of anxiety about the possibly-faux college acceptance letter! PHEW I’m glad it was legit– how sad for those other 2500 people, though! I hope you get your esophagus all sorted out That sounds annoying and scary. Ha! I brought home some “roommates” when I was in high school. Our student naturalist class had to take home the animals over Xmas break. I brought home two doves and a chinchilla. 🙂 Congrats on your daughter being accepted-for-real! YAY!! And yikes – sorry about the swallowing issues. Botox, huh? Crazy. My son is now wanting to get rid of his “roommates”. One in particular is quite mean and keeps biting him. Time to call the local animal shelter! No botox yet, maybe in 2014. Holy Crap I would have had more than just a hot flash…I think I would have had a flow blown Costanza moment. Glad it turned out O.K., though. I am a very calm person by nature so I don’t have Costanza moments though they sound like fun! I’m too darn stoic (without meaning to be) and I somehow maintain full composure. I remember when my son was little and a friend hit him in the head with a hockey puck. He was bleeding profusely and I called my husband before heading to the hospital and calmly explained that our son had a gash on his head and was bleeding but not to worry because I was on my way to the hospital with him. And when the doctor thought I was having a heart problems and told me to go to the hospital STAT and I calmly told my daughter that I was going to the hospital for a day or two and that she could still get her nails done in my absence. What’s wrong with me???? LOL. I saw from one of your friends comments that your name is Maria. That’s so much prettier than Brickhousechick ! Congrats to your daughter. 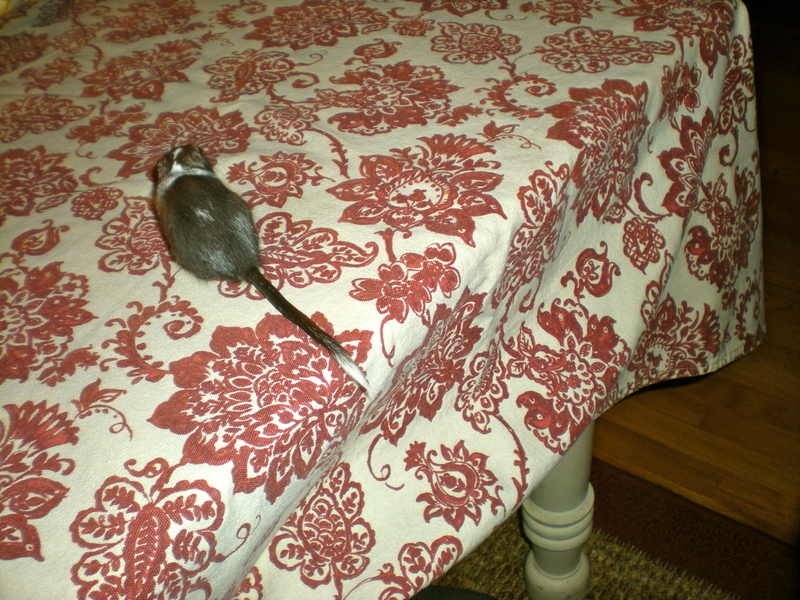 Would you like some recipes for Gerbil ? Barbecue…, Gerbilburgers…, Gerbil Kabobs ??? As for the swallowing thing…, have the doctors checked for Bell’s syndrome? My step-son is recovering from it and trouble swallowing was one of his symptoms. Take care now. You can call me Maria. I try to maintain some sort of anonymity to protect the innocent (my husband). Gerbilburgers sound succulent. 🙂 Drs. have checked for Bell’s and everything else, I will have to give Botox a try! At least my esophagus will be wrinkle free! Woohoo for the not false positive on Fordham! And parties can’t be bad, can they? At least your son thinks you are cool enough to bring two of his roommates home for the holidays. As for the swallowing, I have the same problem. It’s a hiatal hernia, and it is hereditary. (I inherited it from Roy, though you’d never guess by looking at him.) I’d love to know if Botox works. I like that, the not false positive! 🙂 I definitely am cool enough for two gerbils, it appears! The good thing is that they don’t eat as much as real roommates do. Egad! Hope they get the swallowing sorted soon. Maybe in a brilliant confluence of events, the gerbils will push you over the edge, and you will consume them in a delicious stew served as a congratulations dish for your daughter, and it will heal your throat as well! Guapo, this is why they pay you the big bucks. You always come up with the ultimate solutions to all (well most) of my life’s problems! Brilliant! They eat guinea pigs in Peru, surely gerbils must also taste like chicken! Soup is on! Shelley, I have got to get some other benefit here! I think the medical community owes me something for all my bizarre and cure-less ailments, right? I’ve always wanted clown like lips! Yes, yes, Now you’ve got the spirit. I personally would go for the trout lips. You go girl! I think I do like trout lips better than clown lips, thanks for that. You’ve got to think positive here by planning ahead. Quick! Make a list of where to inject the extra Botox. And there’s always extra Botox! Now for me, that would be a little bit around the mouth, hmmm the eyes… 🙂 Feeling better?? Oh man, I remember when the pet of choice at our house was rats. Hang in there with the gerbils. They look kind of sweet actually. Congratulations on your daughter’s REAL acceptance. The college application is tense enough without fake acceptances. May your throat muscles relax, with or without Botox. Maybe the spasms have something to do with college application processes? Wouldn’t that be nice? Happy holidays. Boo-I am so sorry. My mother has to take a pill for that same problem, but I don’t know what it is…sorry. You might want to stay away from my blog until you can eat properly again. You know my issues with food…. Well, you can never say your life is boring or uneventful! RA – seems like my dad has had trouble swallowing, but I wouldn’t swear to it. Good luck. Thanks, Pam. There may also be a correlation between some of the medications used for RA which can cause dysphagia. Wow. Botox does everything! I didn’t realize it had so many uses until I saw a commercial for it. You’ll be in my thoughts and prayers. Glad you can get some relief. Swallowing issues are so scary. Gerbils are so cute. 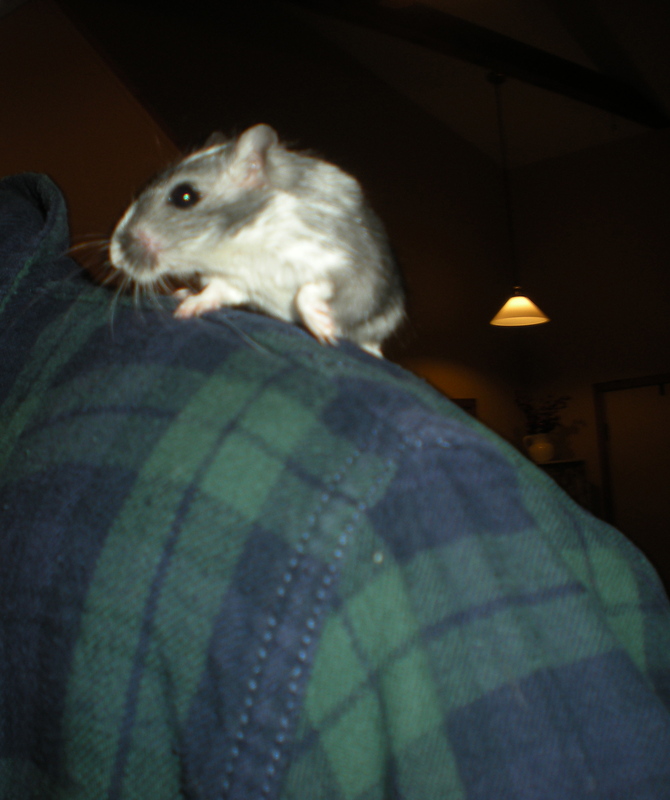 I used to have a pair of gerbils. Contrary to popular belief, they didn’t like rolling in that ball.that some gerbils like.